Some diseases can be prevented with vaccinations, while others are treated with a single round of antibiotics. Chronic medical conditions, such as diabetes, kidney disease and heart disease however, are not so easily handled. These diseases are not uncommon and usually required lifelong treatment and monitoring. 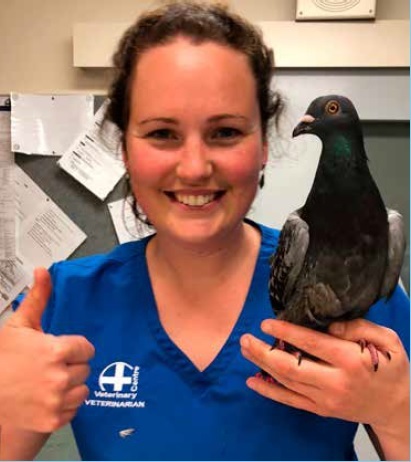 Abby is one of the highly skilled veterinarians in our Oamaru clinic who “has a particular passion for providing the best care and quality of life for these patients”. She has recently taken on the key role of managing all of our long term patients. Abby has an advanced knowledge in chronic medical diseases and has impressively completed master’s papers in cardiorespiratory medicine, endocrinology, neurology and gastroenterology. Max was hit by a car and sustained a severe injury to his front leg, shattering the bone just above his elbow joint. This type of injury often results in amputation, but both Max’s owners and his veterinarian Sarah were determined to save his leg. Sarah’s orthopedic skills were put to the test during a 3 hour surgery in which several metal pins and a frame known as an external skeletal fixator were inserted to hold Max’s bones in position. This frame remained in place for 3 months while Max healed. We are proud to report that Max has made a full recovery and is enjoying life with four good legs. Murphy was visiting the Veterinary Centre for a routine check-up when his owners mentioned that he had quite bad breath. An oral examination revealed he had a bit of a build-up of tartar on his teeth and he was admitted to the hospital to give these a good clean and polish. During this procedure, it was noticed that the gum around one of his molars was a bit inflamed. An x-ray of this tooth revealed an abscess at the root of this tooth meaning it needed to be removed. After his treatment, Murphy’s owners report he has a new lease on life, is playing more, wagging his tail and is generally much happier. 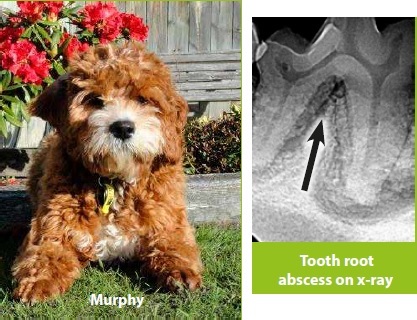 Dental disease is extremely common in our pets and may be the cause of significant pain that goes un-noticed. 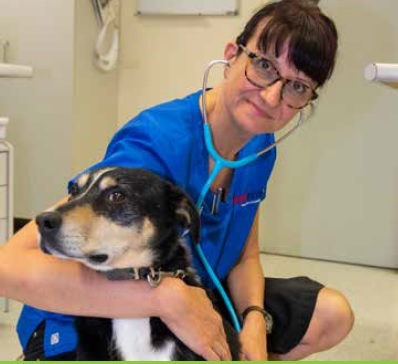 Please don’t hesitate to bring your pet into one of our Blue Cross Veterinary Centres for a dental check-up to ensure they are not suffering in silence. Recently Max came to our Blue Cross Veterinary Centre after having coughing fits at home. He had a dry, hacking cough and was also intermittently retching which his owner found very distressing. Despite his cough, Max was still eating and drinking normally. 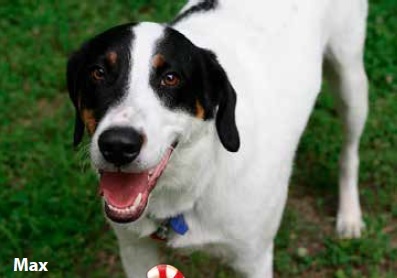 Max was diagnosed as having Kennel Cough, one of many recent cases. A thorough veterinary examination found Max had a normal temperature and clear lungs and he was sent home with his owner for close monitoring and recovery. Following diagnosis if you notice nasal discharge, a wet cough, lethargy, fever or loss of appetite seek further veterinary advice. Two weeks later Max’s owner reports that the coughing has ceased and he is back to his normal self! As the weather warms up the car trips to holiday destinations begin. Here are some tips for travelling with puppies…. It is thought that the immature ear structures of puppies contribute to motion sickness; there is also a learned effect of nausea associated with the car. Sit in the parked car and play with your puppy while the door is open. Once your puppy is happy sitting in the car then turn the engine on briefly. Build car exposure gradually. Never drive further than they are comfortable with. Start with very short trips to fun places like the park and then come home again. Ensure your puppy is comfortable. Make sure the pup is secure - crates or harnesses are the safest option. Keep the air in the car cool. Ensure the dog faces forwards while travelling. Never feed a puppy just before a car trip. 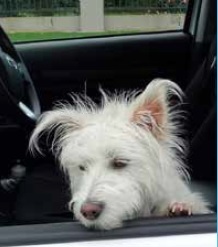 If your pup is already sick or fearful then take a break from the car. There are drug therapies that can be prescribed by your vet for pups that are very badly affected. Our team of friendly staff are happy to discuss how to best help your pup avoid car sickness this holiday season. 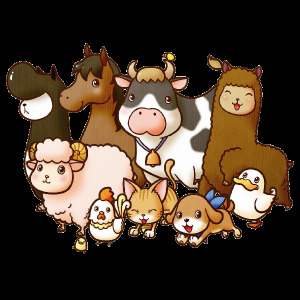 Adequate care and attention of convalescing animals is essential to ensure recovery with minimum stress. We have a large modern secure hospital area, equipped with 24 hours controlled ventilation, animal shower, underfloor heating (and even a stereo system with soft background music!). Attached to the hospital is an external run, and we also have a grass exercise enclosure. When building our new Veterinary Centres over the recent years we have endeavoured to lead the charge in quality animal hospitals and offer many (if not all) of these facilities at our branch clinics. All hospitalised animals are given their medication, cleaned, fed, watered and toileted twice a day, seven days a week - the menu is varied according to the patient’s taste. Debilitated animals are tended to much more frequently. The hospital patients are checked hourly, groomed (and talked to!). All animals recovering from operations are supervised continuously until they are conscious and sitting up. After hours animals are checked by our vets, but you will often see our nurses “sneaking in" checking on their special cases. Max is an 11 year old Labrador who suffers from a condition called laryngeal paralysis. This is a devastating disease that is most commonly seen in older Labradors and other large breed dogs. The larynx has two folds that should open when breathing, and close when eating or drinking so food and liquid doesn't go down the wrong pipe. In pets with laryngeal paralysis, none of this happens and either one or both folds of the larynx are paralyzed. It makes taking a good, deep breath difficult to impossible. Max's owners had noticed his noisy breathing 6 months earlier, but as the disease progressed, he began to suffer terrifying episodes of collapse and being unable to breathe. Such episodes are brought on by stress, in the form of excitement, fear, anxiety, or overheating. In Max's case a surgical procedure to "tie back" one side of his paralysed larynx was recommended. Max underwent surgery with Dr Sarah Boys, and this was a great success. While Max must now be careful when eating and is no longer allowed to go swimming, he is breathing normally again and acting like he is 2-3 years younger. Dacryocystitis in rabbits is where the nasolacrimal duct becomes infected. The duct is long and windy and can become easily blocked resulting in a very mucky eye and surrounding fur. It is really important to always check affected rabbits for any concurrent dental disease as the roots of the diseased upper molars can put pressure on the duct causing occlusion and infection. Affected rabbits require frequent duct flushing and medication (sometimes for weeks) until the infection is under control and the duct has become patent again. Most of the time rabbits are really cooperative with this and it can be performed under local anaesthetic to the eye. Other common rabbit and guinea pig ocular problems include scratches to the eye, or foreign bodies especially seeds/straw behind the eyelids which require prompt removal/treatment to preserve the eyes and vision. 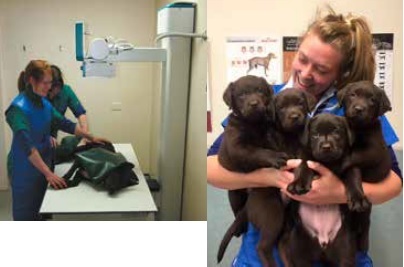 If you have any concerns about your small furries eyes contact any of our Blue Cross Veterinary centres today. Meet Pepper. He is a boisterous nine month old German Shorthair Pointer that mistook eight Nespresso coffee pods for play toys. He came into our Blue Cross Clinic seizuring on the 25th of March. Coffee pods are expresso concentrated coffee and are extremely toxic to cats and dogs. The active ingredient is methylxanthine and dogs are much more sensitive to the effects of methylxanthine than humans. Methylxanthine (present in chocolate and caffeine) can cause anxiousness, tremors, vomiting, diarrhoea, seizures, increase heart rates and affect heart rhythm. If not seen immediately then ingestion can be fatal. A dose of up to 60mg/kg of caffeine can cause seizuring and Pepper ingested 3 times that amount. So make sure to store your coffee pods (and chocolate) in a safe place so your dogs and cats can't get into them. If you have noticed your animal has ingested coffee, chocolate or the contents from a coffee pod ring your Blue Cross Veterinary Centre as it can be an emergency.